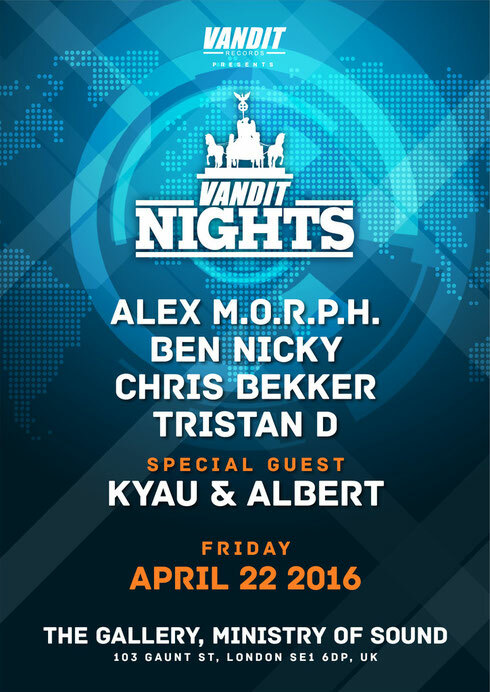 Vandit Nights lands at Ministry of Sound in London on Friday 22 April 2016 for their latest showcase. Deck-side will be Alex M.O.R.P.H., Ben Nicky, Chris Bekker and Tristan D., adding their own style to the label’s specially invited guest for the evening, Kyau & Albert. This year sees the label celebrating its 15th year of operations in 2016, with this party taking place at The Gallery club night. Heading over from the label’s German heartland will be Alex M.O.R.P.H., ‘Berlinition’-specialist Chris Bekker and – celebrating their own special 20-years-together anniversary this year – PvD faves, Kyau & Albert. Keeping the UK’s side of the channel represented will be Ben Nicky (of ‘680’, ‘Air’ and ‘Brave Heart’ fame) and Brighton’s Tristan D.